Protogame uses a render pipeline to allow multiple render passes to build the final result that is rendered to the screen. This allows post-processing effects to be easily applied to your game. The Protogame render pipeline is broken up into two stages; the standard render stage and the post-processing render stage. Each render stage consists of fixed render passes and transient render passes. Fixed render passes are added to the pipeline during game startup CoreGame<TInitialWorld>.ConfigureRenderPipeline, and added or removed from the pipeline at runtime with IRenderPipeline.AddFixedRenderPass and IRenderPipeline.RemoveFixedRenderPass respectively. 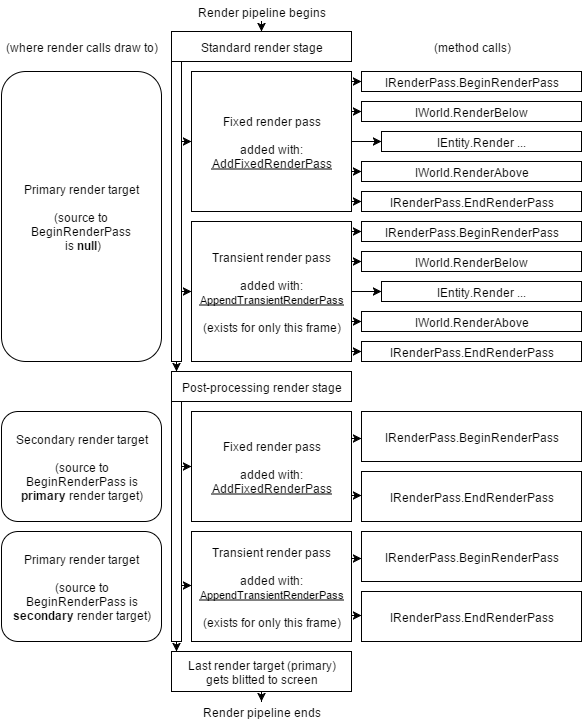 Transient render passes are appended to the current frame of the render pipeline with IRenderPipeline.AppendTransientRenderPass. Transient render passes are only used for the current frame, and do not occur on any future frames unless you call IRenderPipeline.AppendTransientRenderPass again. During the standard render stage, all render passes are directed at the same render target, and are applied in order. These render passes are used for general game rendering. For example, you can render your game in a Protogame.I3DRenderPass, and your UI in a Protogame.I2DDirectRenderPass or Protogame.I2DBatchedRenderPass. During the post-processing render stage, each render pass is provided a render target representing the result of the previous render stage. These render passes are for applying additional effects after your game has been rendered. Render passes can be created by injecting the Protogame.IGraphicsFactory service, and using the methods available.